Salome Ramras Arkatov, Director/Producer has combined her love for the audio and visual arts as a musician and artist throughout her life. She graduated from the Juilliard School with a BS in Piano Performance and received an MA degree from the Claremont Graduate School in Aesthetics and Audio-Visual Education. After resuming her graduate study in piano and while living with her mentor, Rosina Lhevinne, Mrs. Arkatov began recording Mme. Lhevinne's oral history. In 1975, Mrs. Arkatov directed the filming of Rosina Lhevinne’s 95th birthday celebration in Los Angeles and continued the oral history recordings until Mme. Lhevinne’s death at age 96. At that time, Mrs. Arkatov was left vast Lhevinne archival material of the 19th and 20th centuries. 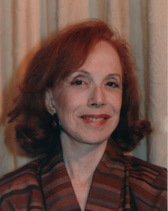 Salome Arkatov became a member of the piano faculty of the University of California at Los Angeles (UCLA) in 1976. Commemorating the centennial of Mme. Lhevinne’s birth in 1980, Salome Arkatov created and developed an acclaimed a four hour radio documentary series on Rosina Lhevinne, titled “A Portrait of Rosina Lhevinne,” with station KUSC in Los Angeles. The program was funded by the Andrew W. Mellon Foundation and received wide distribution on National Public Radio and the Canadian Broadcasting System. The positive audience response served as stimulation for Mrs. Arkatov to later create a visual as well as audio documentary about the legendary pianist and master teacher. In 1988, the Office of Instructional Development awarded her a major in-kind grant to commence an educational documentary on Rosina Lhevinne. Upon Mrs. Arkatov’s retirement from UCLA in 1993, she was honored by the Danforth Foundation for her humanistic teaching and by the university for her innovative instruction. Mrs. Arkatov then turned her focus to filmmaking and created two documentaries. Her first film, The Legacy of Rosina Lhevinne, was completed in 2003 as a tribute to her great teacher and mentor. Among the many awards received are: First Prize Woman Director at the San Luis Obispo International Film Festival ; and First Prize, Festival Theme Award: Enriching the Human Spirit Through Film at the Ojai Film Festival, and Grand Prize at the Rhode Island International Film Festival. After the untimely death of John Browning, Mme. Lhevinne’s renowned student, Salome Arkatov was motivated to create a film honoring her close friend. It is titled Memories of John Browning: The Lhevinne Legacy Continues and was completed in 2007. The film has been highlighted at such events as the Music Teachers National Association Conference, Portland International Piano Festival and was featured in the Skirball Cultural Center’s Cultural Film Series, The Irving S. Gilmore International Keyboard Festival and The International Rachmaninoff Society Conference.